Oatmeal has always been one of my cold-weather breakfast choices but I typically stuck to the instant variety for convenience in the mornings. Peaches and cream has always been my favorite flavor, with strawberry following as a very close second. On multiple occasions I’ve tried the unflavored versions of oatmeal so I could add my own flavorings and hopefully make it healthier, but it just never tasted as good as the flavored varieties. The baked oatmeal train has been around for quite some time but because of the above flavoring issues, I’ve never had any real interest in getting on board. 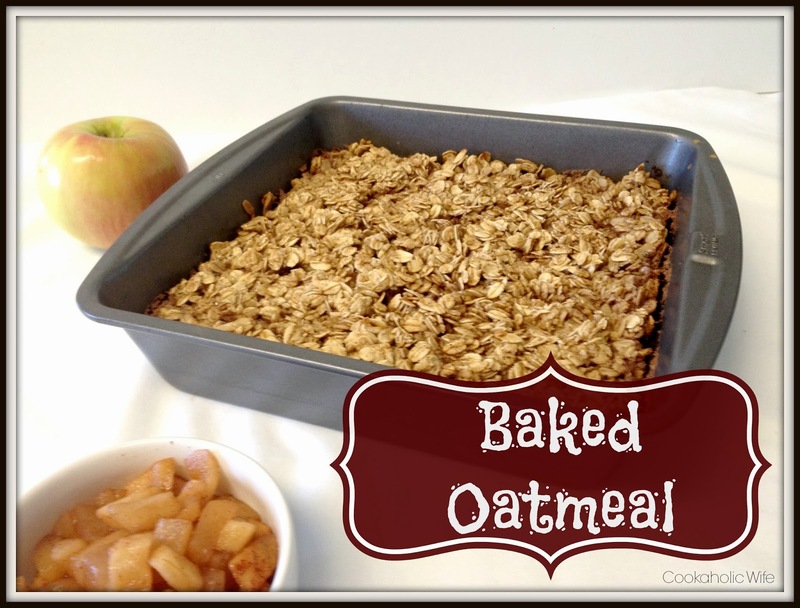 It wasn’t until I saw Sarah post a baked oatmeal recipe that I decided to finally make it. Why? She doesn’t like oatmeal but was still willing to try it and I figured if she could try to like it, I could certainly try to like this version. 2. Place the butter in an 8×8 baking dish and place in the oven for a few minutes or until melted. 3. In a large bowl combine the flour, sugar, baking powder, salt, cinnamon and nutmeg. In another bowl, whisk together the eggs, milk, maple syrup and vanilla. 4. Pour the wet ingredients into the dry and stir well with a wooden spoon until all of the dry ingredients are fully coated. Spoon into the buttered dish, press down until evenly spread and flat, and bake for 30 minutes or until golden brown around the edges. 5. Serve hot, or let cool before dividing into individual containers. Keeps for 1 week in the fridge. To eat from fridge: add 1/4 – 1/2 cup hot water and stir. Microwave until heated through. This is really, really good and much denser and more filling than I expected it to be. I had mine with some cinnamon-sugar baked apples mixed in every morning and I was more than full until lunchtime. If you’re like me and need to eat breakfast at work or very quickly, I think this is a tasty choice to warm you up and keep you full. Yay, another person who isn't a huge fan of oatmeal. I do like this one. I don't crave it but it's a great, easy breakfast. I've had it with bananas, yogurt and mini chocolate chips and also with peanut butter. Really good and filling.